THE B-MOVIE NEWS VAULT: New DVDs & Blu-rays for 09/29/2015! September's over and you know what that means: Only 31 days 'til Halloween! (Sil-ver Sham-rock!) It's time to stock up on fright flicks, and luckily it seems like you can save most of your dough this week. There's not too much to brag about aside from Sony's CHRISTINE Blu-ray disc (which is a far more affordable release than the Limited Twilight Time Blu-ray), and Kino Lorber's SAVAGE WEEKEND (available on both DVD and Blu-ray). There are a ton of direct-to-DVD titles though, and a must-own DVD set of Cannon Films titles that includes the all new ELECTRIC BOOGALOO: THE STORY OF CANNON FILMS documentary! Scroll on down to see what's new this week, but remember, Halloween is coming and so are numerous genre titles on DVD & Blu-ray that you will want to own (e.g. 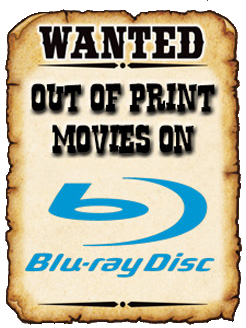 Scream Factory's ARMY OF DARKNESS 3-DISC COLLECTOR'S EDITION), so plan accordingly fellow collector's of physical media! Contains: Red Cliff, The Warlords, Legend of the Tsunami Warrior, Vanquisher, Chocolate, Raging Phoenix, The Bodyguard, and Dynamite Warrior. Contains: Missing in Action, Invasion U.S.A., Cobra, The Delta Force, Masters of the Universe, Over the Top, Bloodsport, The Hitman, Hellbound, and Electric Boogaloo: The Untold Story of Cannon Films.